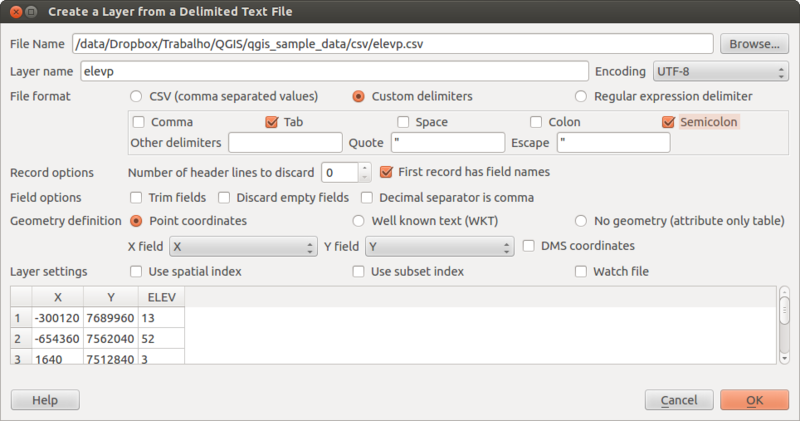 QGIS Browser is one of the main panels of QGIS that lets you quickly and easily add your data to projects. It helps you navigate in your filesystem and manage geodata, regardless the type of layer (raster, vector, table), or the datasource format (plain or compressed files, database, web services). right-click on its name and select Add selected layer(s). Your layer is now added to the Layers Panel and can be viewed in the map canvas. 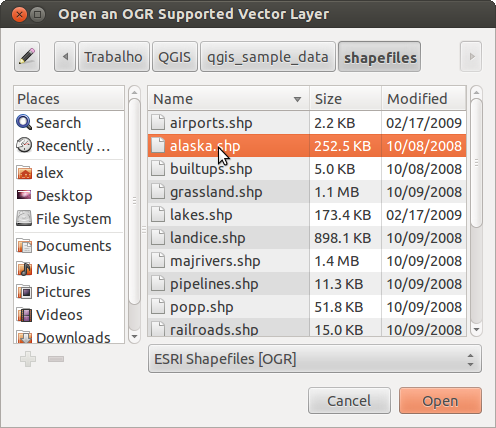 You can also add a layer or open a QGIS project directly from the Browser panel by double-clicking its name or by drag-and-drop into the map canvas. Once a file is loaded, you can zoom around it using the map navigation tools. To change the style of a layer, open the Layer Properties dialog by double clicking on the layer name or by right-clicking on the name in the legend and choosing Properties from the context menu. See section Style Properties for more information on setting symbology of vector layers. The DB Manager Plugin is another one of the main and native tools to integrate and manage spatial database formats supported by QGIS (PostGIS, SpatiaLite, GeoPackage, Oracle Spatial, MSSQL, DB2, Virtual layers) in one user interface. It can be activated from the Plugins ‣ Manage and Install Plugins... menu. More information on DB Manager capabilities are exposed in Complemento administrador de BBDD. for vector data (like Shapefile, Mapinfo or dxf layer), click on Add Vector Layer toolbar button, select the Layer ‣ Add Layer ‣ Add Vector Layer menu option or press Ctrl+Shift+V. This will bring up a new window (see figure_vector_add) from which you can check File and click on [Browse]. You can also specify the encoding for the file if desired. Selecting a file from the list and clicking [Open] loads it into QGIS. More than one layer can be loaded at the same time by holding down the Ctrl or Shift key and clicking on multiple items in the dialog. 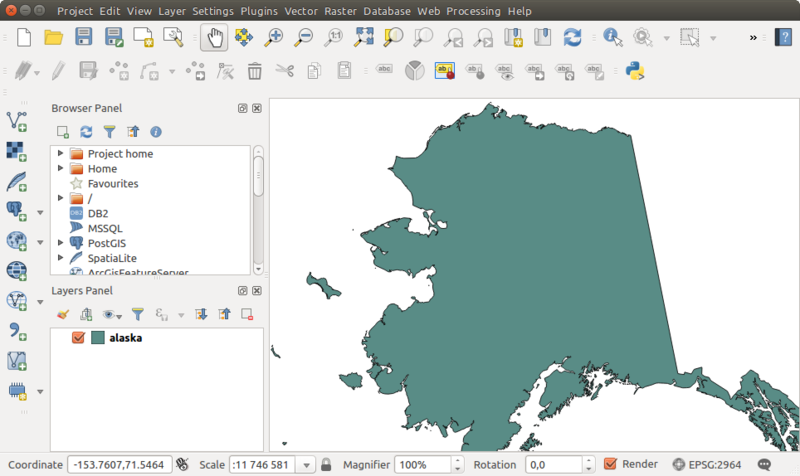 Figure_vector_loaded shows QGIS after loading the alaska.shp file. You can also load specific formats like ArcInfo Binary Coverage, UK. National Transfer Format, as well as the raw TIGER format of the US Census Bureau or OpenfileGDB. To do that, you’d need to select Directory as Source type. In this case a directory can be selected in the dialog after pressing [Browse]. Pressing the [New] button opens the Create a New OGR Database Connection dialog whose parameters are among the ones you can find in Crear una conexión almacenada. 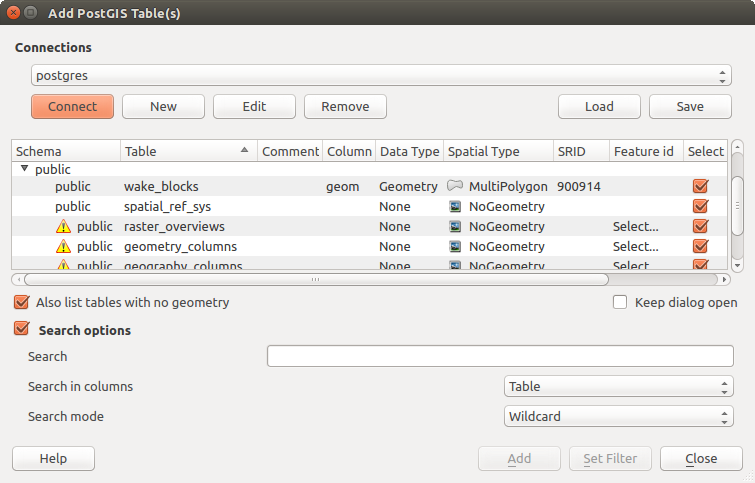 Pressing [Open] you can select from the available tables for example of the PostGIS enabled database. On macOS, portable drives that are mounted beside the primary hard drive do not show up as expected under File ‣ Open Project. We are working on a more macOS-native open/save dialog to fix this. As a workaround, you can type /Volumes in the File name box and press Enter. Then you can navigate to external drives and network mounts. Click the toolbar icon Add Delimited Text Layer in the Manage layers toolbar to open the Create a Layer from a Delimited Text File dialog, as shown in figure_delimited_text. Once the file is parsed, set Geometry definition to Point coordinates and choose the X and Y fields from the dropdown lists. If the coordinates are defined as degrees/minutes/seconds, activate the DMS coordinates checkbox. Finally, enter a layer name (e.g., elevp), as shown in figure_delimited_text. To add the layer to the map, click [OK]. The delimited text file now behaves as any other map layer in QGIS. There is also a helper option that allows you to trim leading and trailing spaces from fields — Trim fields. Also, it is possible to Discard empty fields. If necessary, you can force a comma to be the decimal separator by activating Decimal separator is comma. If spatial information is represented by WKT, activate the Well Known Text option and select the field with the WKT definition for point, line or polygon objects. If the file contains non-spatial data, activate No geometry (attribute only table) and it will be loaded as an ordinal table. To keep the dxf/dwg structure and its symbology in QGIS, you may want to use the dedicated Project ‣ DWG/DXF Import... tool. Indeed, the DWG/DXF Import dialog allows you to import into GeoPackage database any element of the drawing file. the Use curves promotes the output layers geometry type to a curved one. 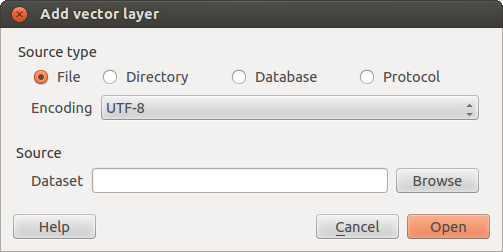 Press [OK] to open the layers in QGIS. The menu Vector ‣ OpenStreetMap ‣ Export Topology to SpatiaLite... then allows you to open the database connection, select the type of data you want (points, lines, or polygons) and choose tags to import. This creates a SpatiaLite geometry layer that you can add to your project by clicking on the Add SpatiaLite Layer toolbar button or by selecting the Add SpatiaLite Layer... option from the Layer menu (see section SpatiaLite Layers). Loading GPS data in QGIS can be done using the core plugin: GPS Tools. Instructions are described in Section Plugin de GPS. Working with GRASS vector data is described in Section Integracion GRASS SIG. 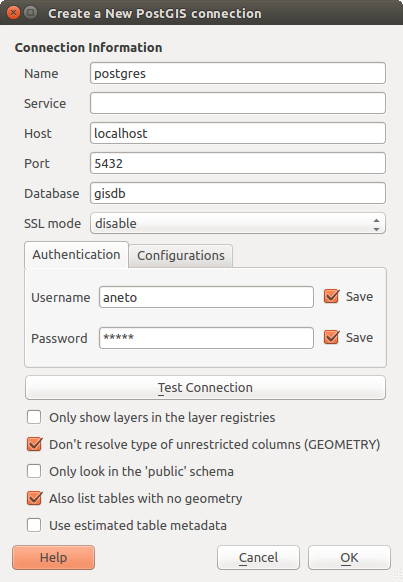 This will bring up a window that will allow you either to connect to a SpatiaLite database already known to QGIS, which you can choose from the drop-down menu, or to define a new connection to a new database. To define a new connection, click on [New] and use the file browser to point to your SpatiaLite database, which is a file with a .sqlite extension. Most of the connection dialogs follow a common basis that will be described below using the PostGreSQL database tool as example. The first time you use a PostGIS data source, you must create a connection to a database that contains the data. Begin by clicking the appropriate button as exposed above, opening an Add PostGIS Table(s) dialog (see figure_add_postgis_tables). To access the connection manager, click on the [New] button to display the Create a New PostGIS Connection dialog. In the Authentication tab, saving username and password will keep unprotected credentials in the connection configuration. Those credentials will be visible if, for instance, you shared the project file with someone. Therefore, it’s advisable to save your credentials in a Authentication configuration instead (Configurations tab - See Sistema de autenticación for more details) or in a service connection file (see PostgreSQL Service connection file for example). Once all parameters and options are set, you can test the connection by clicking on the [Test connection] button or apply it hitting [OK]. 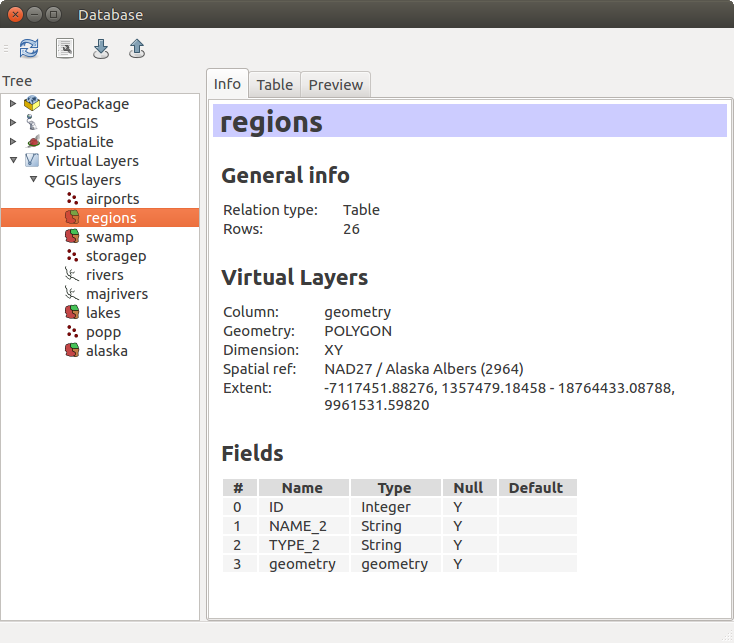 From the Add PostGIS Table(s), click now on [Connect] and the dialog is filled with tables from the selected database (as shown in figure_add_postgis_tables). In addition to some of the options described in Crear una conexión almacenada, the connection to a DB2 database (see DB2 Spatial Layers for more information) can be specified using either a Service/DSN name defined to ODBC or using the driver, host and port information. In addition to some of the options in Crear una conexión almacenada, creating a new MSSQL connection dialog proposes you to fill a Provider/DSN name. You can also display available databases. Once you have one or more connections defined to a database (see section Crear una conexión almacenada), you can load layers from it. Of course, this requires having available data. See e.g. section Importing Data into PostgreSQL for a discussion on importing data into a PostGIS database. Choose the connection from the drop-down list and click [Connect]. Optionally, use some Search Options to reduce the list of tables to those matching your search. You can also set this option before you hit the [Connect] button, speeding this way the database fetching. If applicable, use the [Set Filter] button (or double-click the layer) to start the Query builder dialog (See section Constructor de Consulta) and define which features to load from the selected layer. The filter expression appears in the sql column. This restriction can be removed or edited in the Layer Properties ‣ General ‣ Provider Feature Filter frame. The checkbox in the Select at id column that is activated by default gets the features ids without the attributes and speed in most cases the data loading. Click on the [Add] button to add the layer to the map. select and drag-and-drop it in the map canvas. 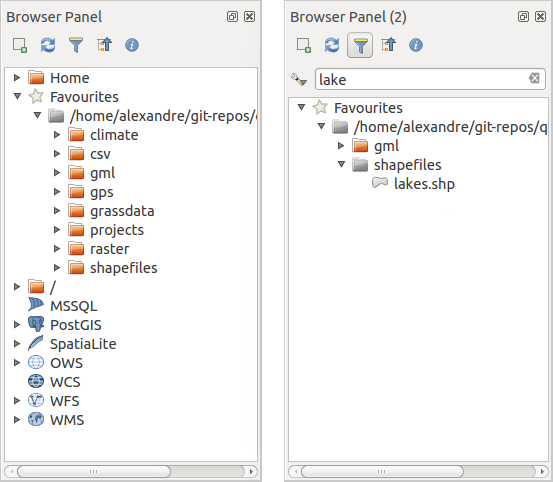 With QGIS you can have access to different types of OGC web services (WM(T)S, WFS(-T), CSW ...). Thanks to QGIS Server, you can also publish these services. Description of these capabilities and how-to are provided in chapter Trabajar con datos OGC.